Early last summer, Nathaniel was in the back yard, practicing his kicks into our KixKube. One particularly strong kick missed the cube, and smashed into the exposed sprinkler valves, breaking through the ¾” PVC pipe below one of the valves. The break led immediately to that portion of the garden and lawn being covered in water, so I rushed to close the water main at the street and then scurried to Home Depot to get a PVC cap and fresh (fast setting) PVC cement. Water supply capped, broken valve turned, a photo by schahn on Flickr. 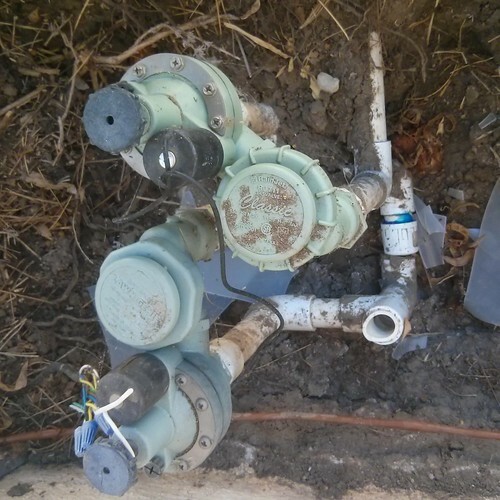 I decided to make two improvements when I rebuilt this complex: to add a ball valve before the sprinkler valves, so that I can make repairs without turning off water to the entire house, and to add a third sprinkler valve for a drip system. You can see the ball valve underneath the rightmost valve in the picture below; the new valve is the leftmost. Sprinklers repaired and robustly reboxed, a photo by schahn on Flickr. It took a bit of tweaking to get the joints and valves sealed tight, with one or two connections having to be redone. 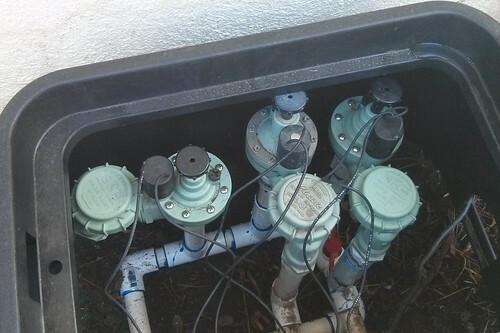 Once I had the valves watertight and the wiring reconnected, my system testing showed that our Rain8 WLM, which was an X10 wireless-based irrigation control, had suffered a power blow-out as well. 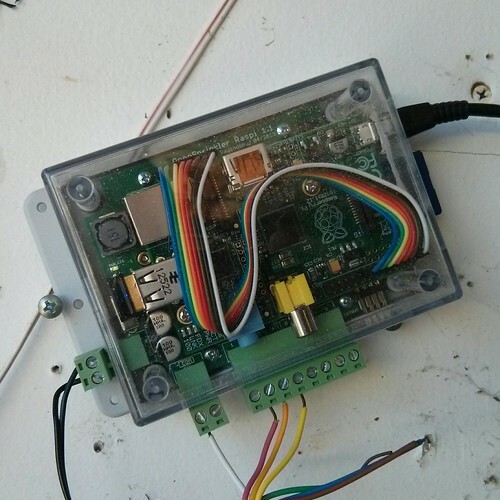 OpenSprinkler Pi, a photo by schahn on Flickr. Since the Rain8 WLM had been discontinued, I decided to replace the controller with an OpenSprinkler Pi, using WiFi for wireless access. For the X10-based controller, I had built my own set of irrigation programs for cooler, which had been moving from shell scripts invoking flipit driven by cron(1M) to using Redis for state and eventually to a web server model, but I dropped all of that—for now—in favour of Sprinklers Pi running directly on sprinkles (the Pi). With the combination of a regular and a seeding schedule, I have equivalent (or better, with the Weather Underground integration) capability to the previous implementation. The new system has been working well. 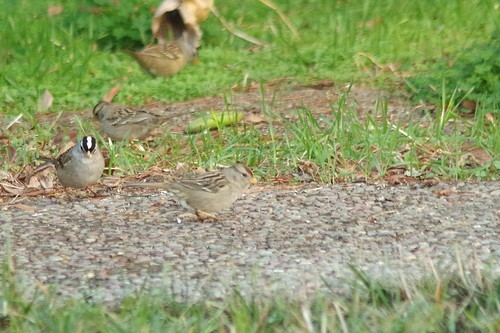 White-crested swallows feeding on grass seed, a photo by schahn on Flickr. Now that we’ve begun repairing the lawn with new grass, the final phase will be plucking out the crabgrass that dominated one corner. 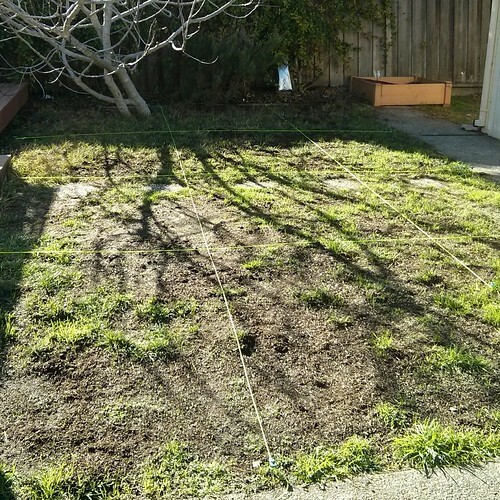 I’m going to work systematically through the lawn using a grid system, plucking out each crabgrass shoot. Grid, a photo by schahn on Flickr. There’s about ½” of new soil spread over top to provide new nutrients, but there are also some pretty beaten down bare patches. We’ll see what the spring growth brings.